A puppy biting your hand or using your pant cuff as a chew toy – cute? Not so fast! Teaching a puppy what is OK to bite when they are young is the single most important item for any pup. 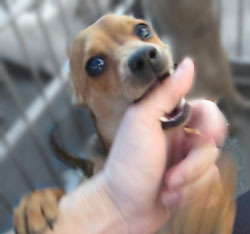 Mouthing and biting is a normal part of being a puppy, but how cute will that be when they bite your hand – or a child’s hand – when they are an adult dog? Damaging dog bites are not cute! Puppies must be taught by people to control the force of their biting behavior so that they learn to have a soft mouth if they do accidentally grab onto a human (instead of a toy or food being offered). Then they should be taught to reduce the frequency of puppy mouthing, so that as an adolescent and adult dog they will not harm a person they are playing with – or their clothing! The program outlined below is best for puppies who are up to about 18 weeks, while they still have their baby teeth, who have not yet learned to control their playful biting. If your puppy is under 6 months and not biting too hard (already has some self-taught bite inhibition), it can still be used – but for dogs older than 6 months that are play biting you, please consult a professional dog trainer. For this program, it is important that EVERYONE who interacts with your dog, (e.g. everyone in your household and any visitors) follows the same rules. Children should be closely supervised to ensure that they are following the rules, too! Puppies normally develop bite inhibition through interaction with their litter mates. When a puppy bites another puppy too hard, the second puppy will yelp and discontinue playing. In this way the first puppy learns not to bite so hard. This technique has you take the place of littermates, and teach in much the same way. In the same way you as humans must act like fellow littermate and let your dog know when he has bitten you too hard. In the first phase of training, if the puppy puts his mouth and/or teeth on you and doesn’t bite down, you can immediately redirect their mouth on to a toy and praise. BUT if the puppy uses pressure (they usually will at some point, they are testing everything out when they are young) so that you are feeling a pinch or more: yelp like a puppy just enough so your puppy notices – and then walk away and ignore him for about a minute. Dogs vary in their sensitivity, so it is important that your yelp volume and intensity is appropriate for your particular puppy. If when you yelp your pup doesn’t seem to notice, or immediately comes back to bite you again, then next time try a louder yelp and move away more quickly. Similarly, make sure that you do not startle your puppy too much. If your pup cowers or runs away tail tucked between his legs when you yelp, then you are most likely yelping too loudly; next time try a quieter yelp. When you return after the minute of ignoring them, make sure you have a toy ready so they can bite the toy, which is good! Reward that good behavior with lots of attention and praise. NOTE: Ignoring means no looking at your dog, no speaking to your dog and no touching your dog! If necessary you can leave the room for that minute (a ‘time out’) so that he has no chance of play-biting you while you are ignoring him. It may be tempting to say an angry “no” and/or push the puppy away. However, this is giving them attention – even if it is “negative” attention. Attention is a reward! You don’t want to reward the undesired behavior. 2. No teeth on you. Once your dog has learned that painful bites are unacceptable and has stopped doing them, you can progress to teaching that any pressure of his teeth against your skin is unacceptable. At this point, the yelp is NOT appropriate. If the puppy puts his mouth on you with no teeth pressure, either redirect onto a toy immediately, or (better) get up and away from puppy to ignore for 30 seconds, then return with toy to play again. 3. No mouth on you at all. Once your dog has learned that he should not put his teeth on you, you can progress to training your dog that any mouthing of you or your clothing is unacceptable by stopping the game or attention when he mouths you. Never hit your dog (his nose or any other part of him) in response to his mouthing or play biting! Not only is this unnecessary but also it will likely encourage him to continue biting you, either in play or in self-defense. Do not forget to provide appropriate chew toys and bones for your dog and praise him for chewing on these. In this way your dog will learn not only what is UNACCEPTABLE but also what is ACCEPTABLE in terms of using his mouth. You may find it helpful to use a taste deterrent (available from pet shops) on your hands or clothing while you are going through this program. First make sure that the product is actually distasteful to your dog (some dogs like the taste of taste deterrents). Make sure your puppy is getting sufficient exercise both mental and physical. Play biting can be a result of being bored and having pent up energy. Once your dog has successfully completed all stages of bite inhibition you will want ensure that your dog continues to have good bite inhibition throughout life. Therefore it is a good idea to handle his mouth daily (open it and touch his teeth and tongue) – easy to do if you are brushing their teeth daily, a great habit – and reward him or her for being gentle with praise and affection.